One of the most common mistakes I see players make is always trying to take the shortest route to the next object ball and, in doing so, having to be perfect with their speed. They seem to disregard the multiple rail shot. I tell my students that if I'm playing position on a ball, I'd prefer to go multiple rails with the cue ball, as opposed to a simpler shot, if it means the cue ball will be traveling on a line directly toward or away from the next object ball. 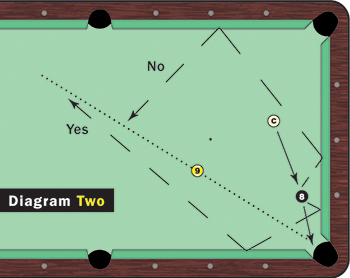 I draw a line in my mind from the next object ball to the intended pocket (dotted lines in the diagrams) and experiment with how to get the cue ball to run along that line. The best way to learn how to find the best path to the next object ball is to set up a shot and take cue ball in hand. Look for every conceivable way to get to the next object ball. Many amateur players will take Path 1 in Diagram One, because it is a simple one-rail shot. But look at how precise the shooter must be with his speed to be in line with the intended pocket on the next shot. 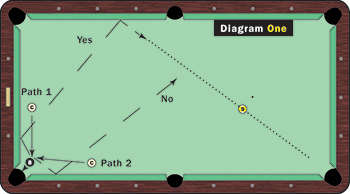 The cue ball must hit multiple rails on Path 2, but it is a far better option, because the cue ball will be traveling toward the object ball along the dotted line. In some cases, there may be several multiple-rail options (Diagram Two). You still want the route that runs along the intended pocket line for the next shot, even if it means the cue ball will be running away from the object ball. Again, you can see the difference between sending the cue ball at the line and hoping to land perfectly on it, and running along the line. Yes, the cue ball is traveling away from the object ball, but this is still a better option. Experiment with these shots. Use high, low, left and right. And, even though it is rarely the best option, practice shots on which the cue ball travels at the line. Sometimes the path along the line won't be available. It's important to learn the proper speed.